I know everyone says this, but 2016 had so many wonderful ups, paired with a few really life altering downs. The ups were incredible, but the downs changed me in ways that I'm still trying to cope and live with, today. When 2016 began, the word "anxiety" really wasn't a major part of my vocabulary. I would use it on topics that generally revolved around something silly like... "This lady that keeps betting one dollar more than the person next to her on The Price is Right is giving me major anxiety." ....or... "I'm having anxiety over the pizza to person ratio." You know, silly things. Then Veenie ate a toothpick while at a petsitter and I was somehow transformed into the biggest worry wart who uses the word anxiety in every other sentence. This stress and fear I constantly feel over the possibility of something happening to the pups, to CB or even to myself has really taken a toll on me. This new found anxiety is something I've decided needs to be addressed in 2017. I'm not sure what I mean by "addressed", just yet. I don't want today to be a sad post, 2016 was amazing. My best friend and partner in crime, CB and I tore up not only Dallas but many other cities across the US! I started new, exciting projects that have my mind buzzing with ideas for 2017! The most important part of 2016 though, was I spent the entire year totally, completely, madly in love. The love is my favorite part. Let's look back on 2016, month by month! This is my 2016 Year In Review, Part 1. Every year for work I start the new year off in Toronto. For 2017, I'll actually be going to Vancouver instead! I'd ask for recs but you guys know how work trips are. Hotel... Convention Center... Hotel... Convention Center. I hope my hotel room view is as good in Vancouver as it was in Toronto! 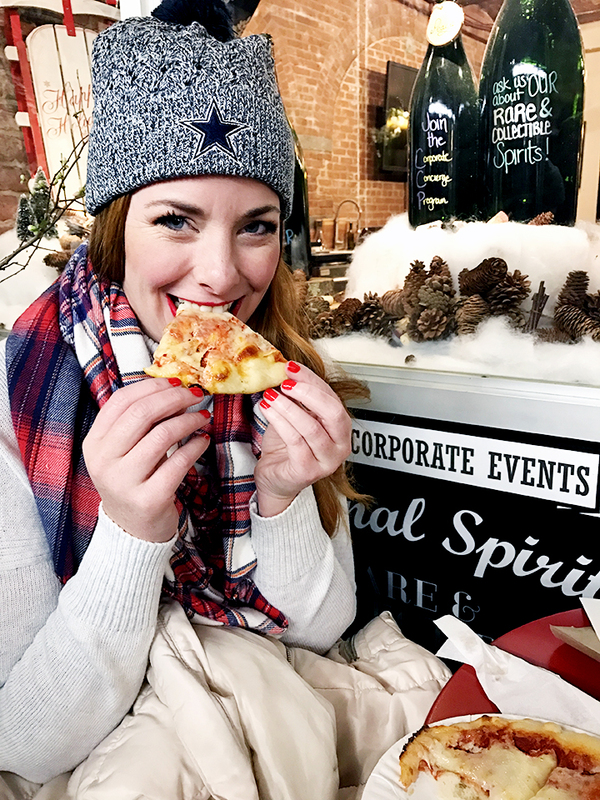 On the blog in January, CB drove all over Dallas trying to find me a pretty donut and wrote a blog post about it. 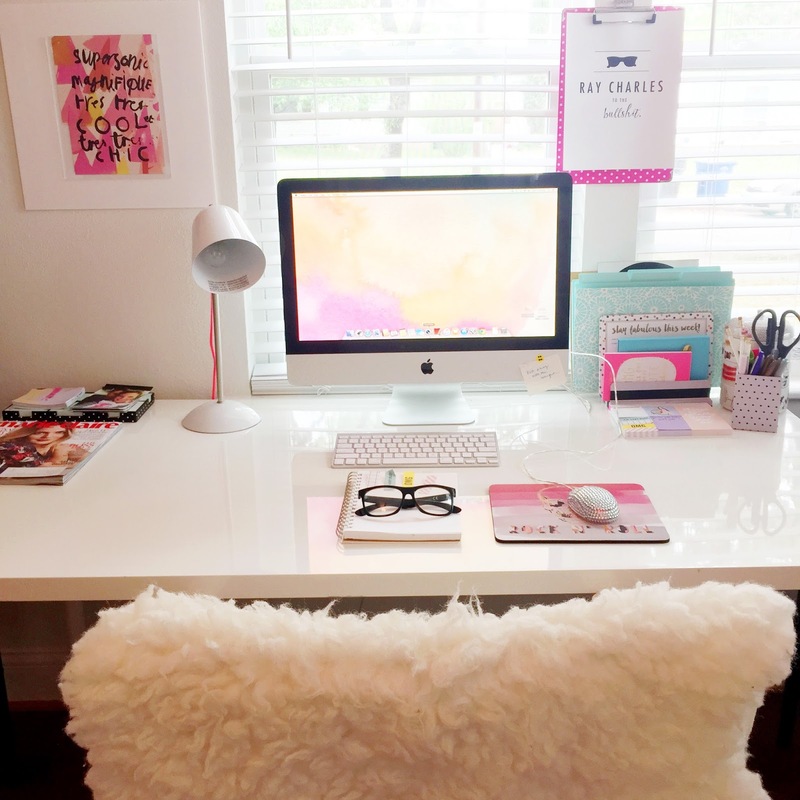 I also struggled (and really still struggle today) with finding my place in the blogging world. 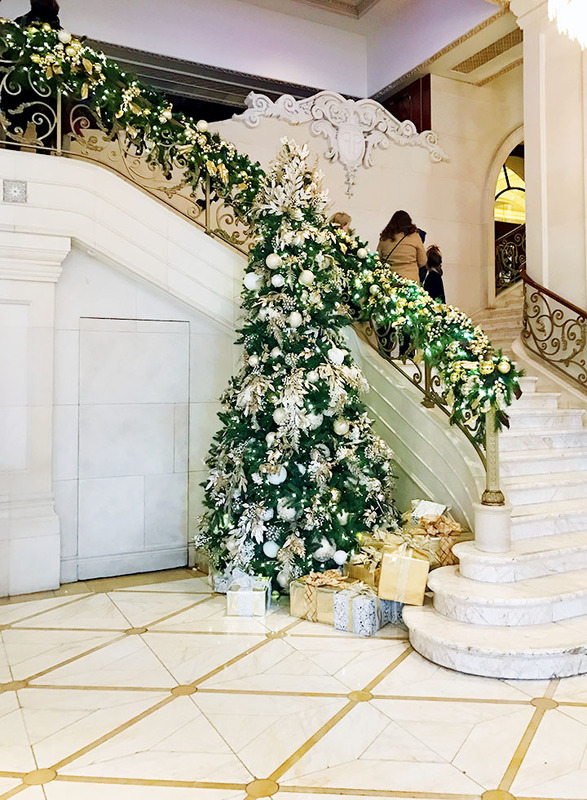 I wrote about that struggle in two posts: Where Do I Go From Here, and Where Do I go From Here Part 2 which was a list of questions I asked myself to see exactly WHAT I wanted from this blog. Hmm... that was a good idea, I might do that one again! I also wrote about What the Value of a Blog REALLY is -- basically why we are so valuable, in my opinion, to advertisers. I also hit 2 Million Page Views (I'm now well over 3 which is super exciting) and celebrated by compiling a list of my favorite posts of all time! I also made one of my favorite cocktails of all time - The Spicy Moscow Mule - that I totally recommend you try! Finally, I finished January with a ski trip (I use the term, "ski" very loosely) to Colorado with CB and friends! The arrival of February is always celebrated on VTIM with SUPER BOWL POSTS! I started with a great post that I'll update again for you this year, "How to Play Super Bowl Squares." This is the one game you need at every Super Bowl party. 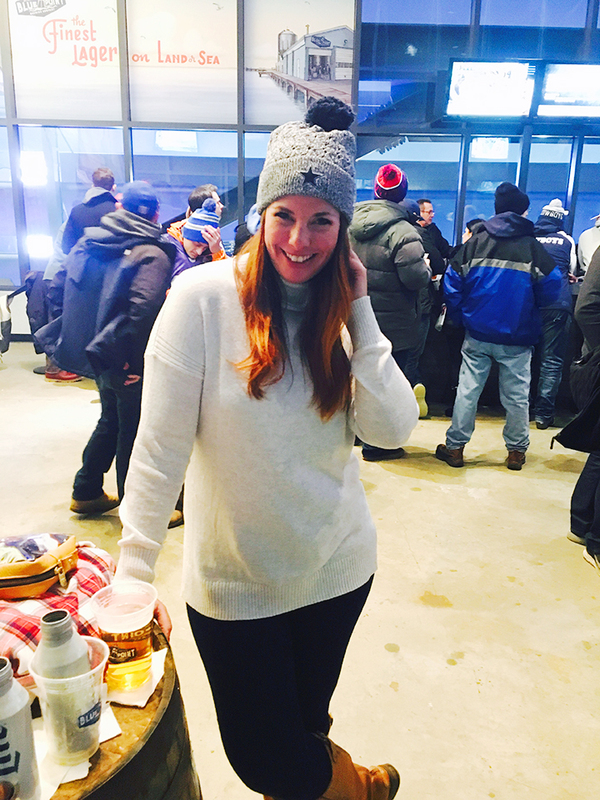 I also wrote one of my favorite sports posts to date: "Female Fan Does Not Equal Kitchen." For some crazy reason, advertisers still want to associate the female sports fan with the kitchen. 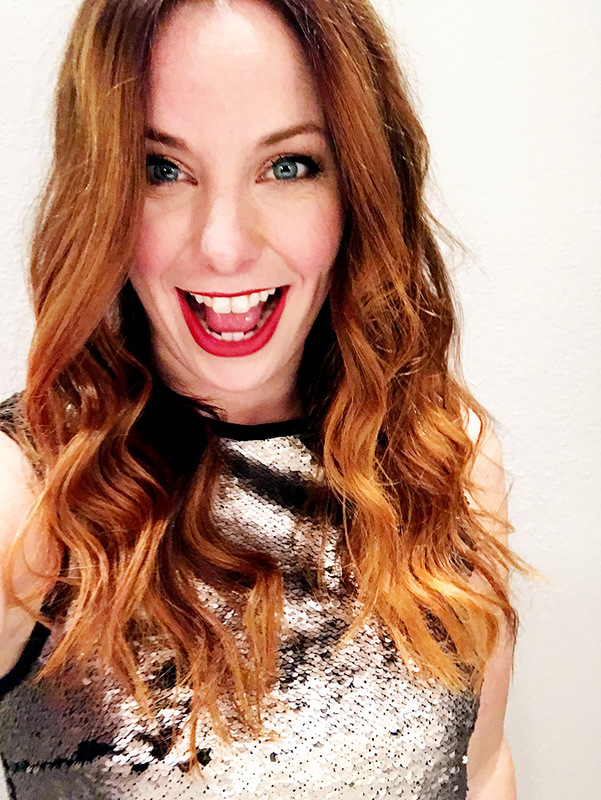 If you're in advertising, read this post for the fool proof formula for reaching us illusive (jk, we're everywhere) female sports fan. I took a couple of trips in February as well. First up was Miami for 10 days. This is my annual work trip, one that happens every year. It sounds glamorous, "Ohhh, Miami! Fun!" but really it is very very long days on my feet, followed by scarfing down dinner then passing out. The scenery is quite lovely though! CB came to visit me in Miami this year and WE GOT EACH OTHER THE SAME VALENTINE'S DAY CARD. I repeat, we both brought cards, from Dallas, to Miami, and it was THE SAME CARD. I wasn't home from Miami for more than a day before I hopped right back on a plane and headed to Nashville to celebrate one of my bestie's 30th birthday! 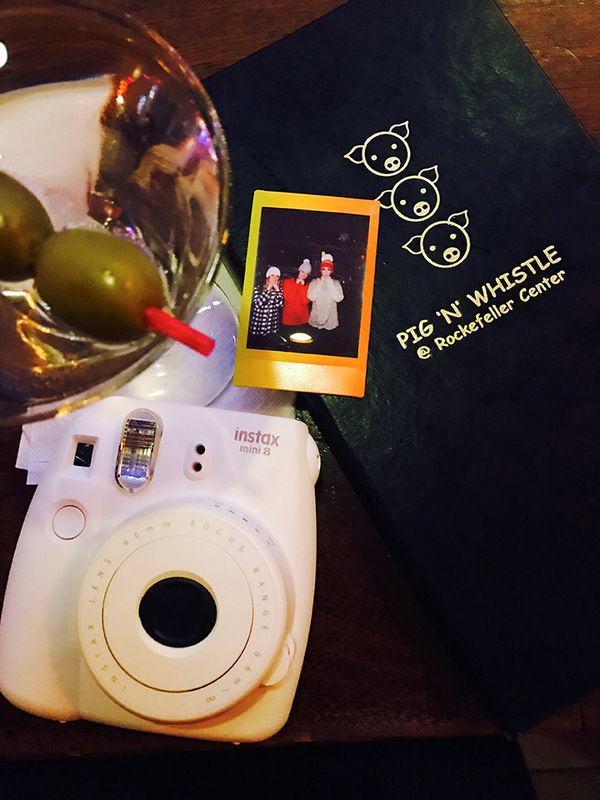 I also wrote a full recap post on our 48 hours in Nashville! I then told the story of how I ALMOST PASSED ON CB!! WHAT?? I started March with an entire list of The Best Pizza in Dallas. Very important post, probably my most important post to date. CB and I also did a quick 24 Hours in Shreveport, which turned out to be a lot of fun. 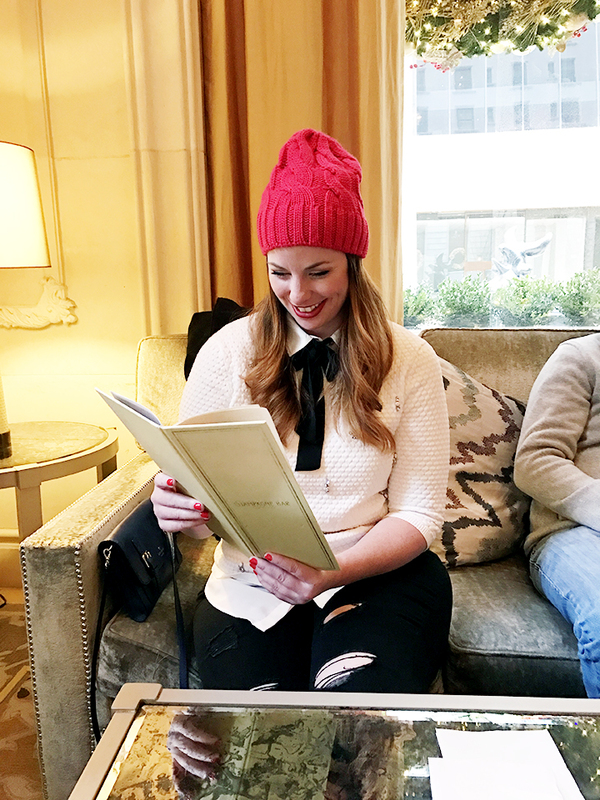 I also spent 48 hours in New Orleans, check out the recap post to see what we did on our first of 2 trips to the Big Easy in 2016! CB and I celebrated St. Patrick's Day in style in Dallas and I made Irish Juleps. 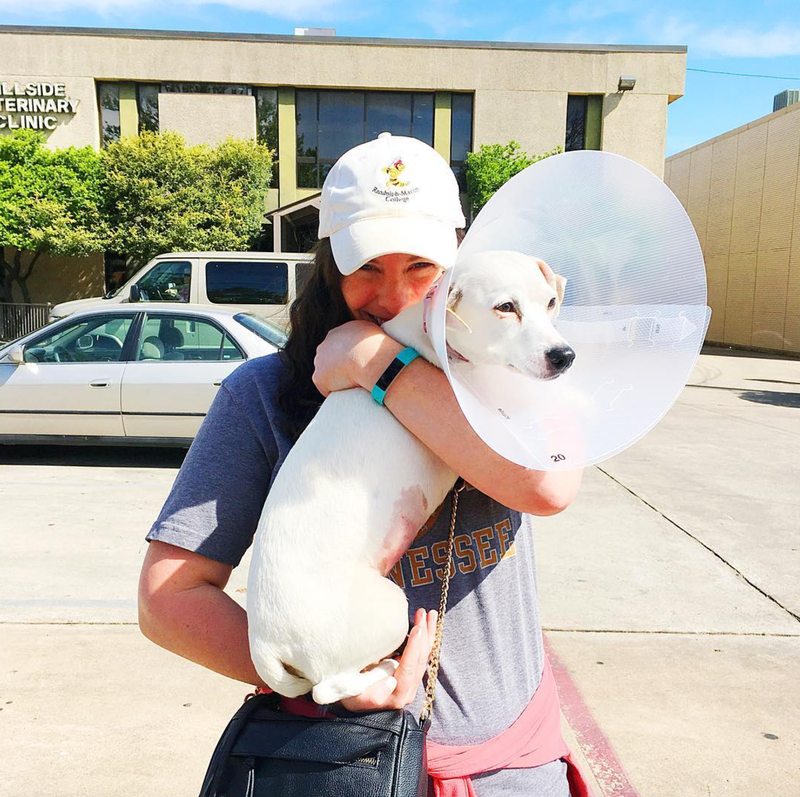 We then road tripped to San Antonio for a fun 48 hours, you can read all about that post via the link, but spoiler alert, CB gets pooped on by a bird and gets pretty bent out of shape about it. April was not my favorite month. While we were in San Antonio, Veenie got sick at a pet sitter. They didn't tell me this until the day I picked her up. I knew something was up with Veenie but the vet did x-rays and really couldn't find anything wrong. Days went by, she was improving, then would take 5 steps back. Then she'd improve again. Then she was rushed in for emergency $6,000 exploratory surgery that Saturday. Then they called that night and said she didn't need the surgery. I'm not joking, this all happened. Then Monday they found the toothpick via an Ultrasound. She had surgery but the damage to her intestines had been done, she had to fight over the next couple of weeks if she was going to live. My little girl fought, and I got to take her home. It was the happiest day I've had in a very long time. Oh, and then the great dog mom I am, I got her confused with another dog in the hospital. Yikes. I kept April pretty low key, and filled it with Veenie and Gee snuggles and kisses. I was so happy to have them both home. I did do some blog posts though! 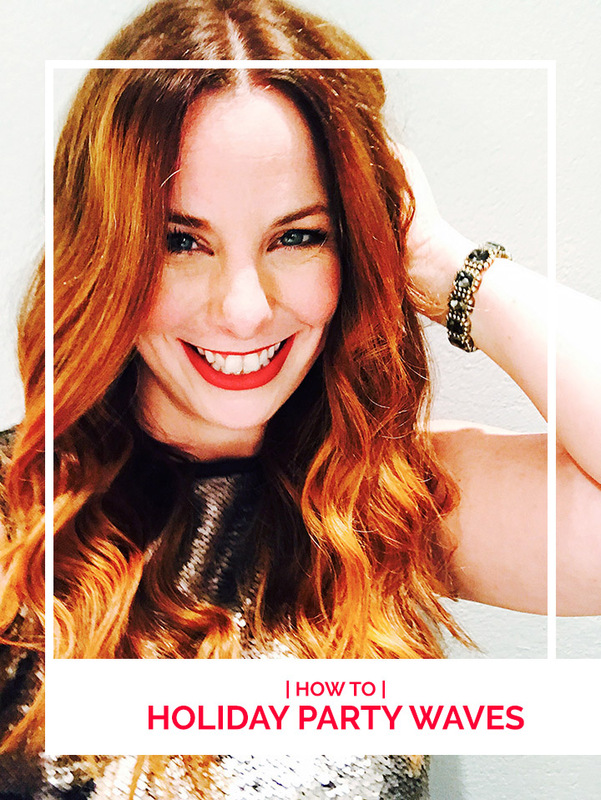 I showed you 6 ways to get great Instagram photos on your lunch break! I also wrote a Very Basic Guide to Hockey, which I hope was clear and not too confusing! I also became a Stage 5 Clinger and I'm still struggling with this to this day. April wasn't all bad, by any means. I learned that I was going to be featured in DMagazine as their reader of the month! May started when some earth shattering news crashed down on me... CB HAD NEVER HAD A BAGEL. It was too much for one girl to handle, and you guys totally agreed with me in the comments section of that post. Bless his heart. CB forced me against my will to go camping, but he let me bring Veenie and Gee so I guess it wasn't SOOO bad. I'm just really not the outdoorsy type. I gave you guys my secret recipe for the best low-cal pizza you will ever eat, I seriously make this thing once every couple of weeks, sometimes more often! 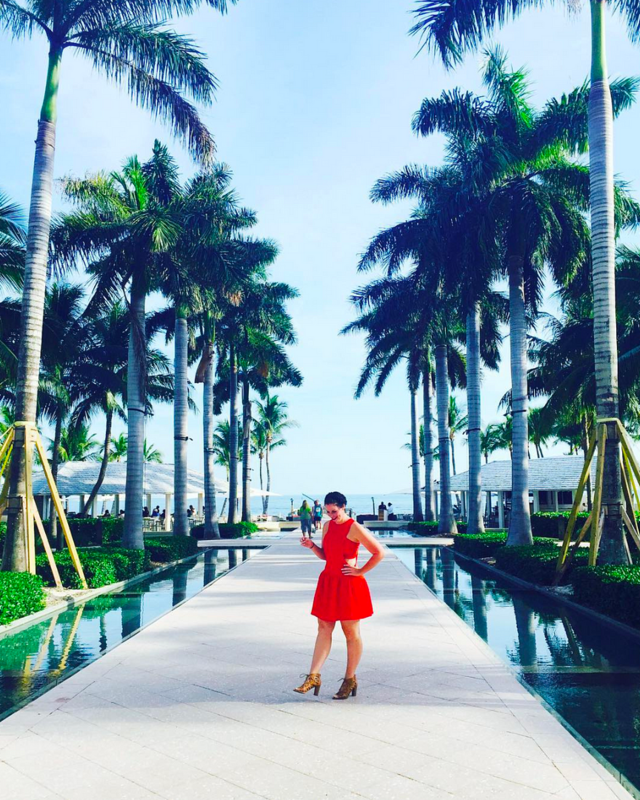 I showed you what has helped grow my blog the most over the years, and that is TAKING ACTION! I talked about why I am so over this whole CB Charade, and why it has gone too far. We also celebrated 2 years of dating and all was right with the world. On that note, I'll wrap this up for today. Who knew year end recap posts would be so long. Oh yeah, maybe the girl blogging for nearly 4 years should know that. Oopsies. I'll be back tomorrow with the second half of 2016 which features the VTIM all Girl Fantasy Football league, Dallas Love List and lots and lots of trips before turning 30! 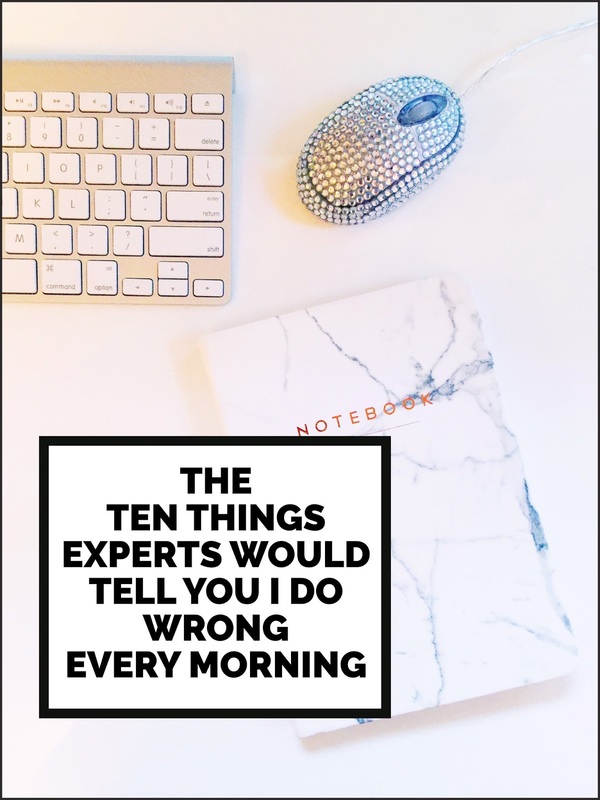 In the morning before work, I probably do everything an "expert" would tell you is totally wrong. I hit snooze. Multiple times. So sue me. In fact, I plan my whole morning around the number of times I get to hit snooze. Did I shower the night before? If so, that means I get one whole extra, blissful, delicious snooze all to myself. Even if that "blissful" extra snooze generally involves Veenie trying to lick inside my ear, while I try to push her back under the covers.... it's still better than being up and at 'em, IMO! Today, I'm kicking off a new partnership with RaceTrac to show you that there is no wrong way to start your morning. So what, you hit snooze! So what, the experts say you will literally combust if you hit snooze. So what, I'm not judging, nor is RaceTrac... it's all about whatever gets YOU going in the mornings. Here are all the things I do wrong -- in the eyes of scientists (or Pinterest, as the case may be) -- to start my morning. I found this data chart on Pinterest showing how to be the best possible morning version of yourself. Let's compare their notes to mine, shall we? There is water in coffee, right? I'm pretty sure I manage to use my phone DURING sleep. I use my phone all the way up until my last top eyelash connects with my bottom eyelash. Snapchat, Instagram Stories... these are my necessary nightly bedtime rituals. I don't have time during the day to watch snaps, so I do it right before bed, it's tradition. I have absolutely zero idea what that is. Is that an app? You told me to turn off my wifi before bed, how am I supposed to use an app? You're setting me up for failure already, Pinterest. I pass this one with flying colors, my APPLE iPhone never leaves my side. In my 30 years on this planet, I have probably gotten up before work to exercise 3 total times and it was horrific each time. Never again. I'll wait until the afternoon because, sleep. OK WHY? I've perfectly timed my snooze schedules to be in a frantic rush every single morning and that works for me. Correct me if I'm wrong, but a rushed, total panic is quite the effective caffeine compliment. With all due respect... and I'm saying with all due respect, that is the dumbest thing I've ever heard. 10. Snooze you lose. Keep your phone far enough away so you have to get out of bed to turn it off. Hilar. Keep it up Pinterest, totes the funniest ever. One thing I love about RaceTrac is that they (sunny) side (up) with me (YIKES, at that joke) --- there is no wrong way to start your morning! Some people want coffee, some people want a diet coke. 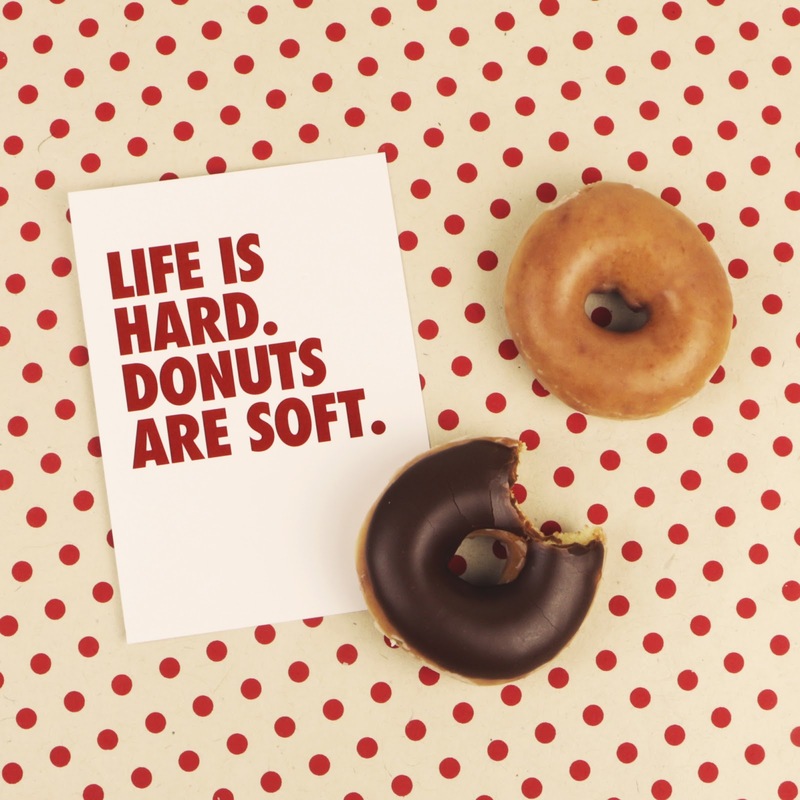 Some people like a grab and go breakfast bar (me), some people want a hot dog, some people want donuts. Whatever it is you need in the morning to get you work ready, RaceTrac has that! This might blow your mind, but Nathan's Famous 100 percent all-­‐beef hot dogs are RaceTrac's top selling food item from 6am to 10am! They don't just grill up hot dogs for sale in the morning hours though, they have taquitos, chicken roller bites and tamales. Want to take a more traditional route in the morning? 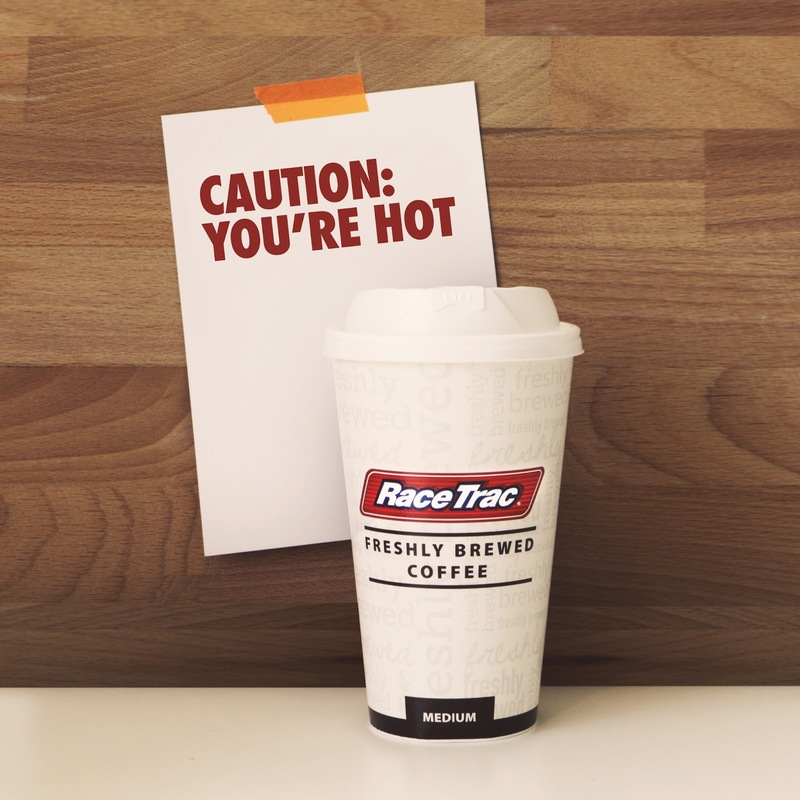 RaceTrac offers a massive coffee bar selection of fresh brewed coffee (hazelnut, regular, columbian, decaf and dark roast) plus all of your favorite creamers, sweeteners and toppings so you can be your own barista. If you prefer a healthy, grab and go option, they have fresh cut fruit, wraps and sandwiches that you can easily snag and take with you to work! So, if you're like me and unabashedly hit the snooze over and over and sometimes like to drink diet soda first thing in the morning, RaceTrac is there for you, totally judgement free! 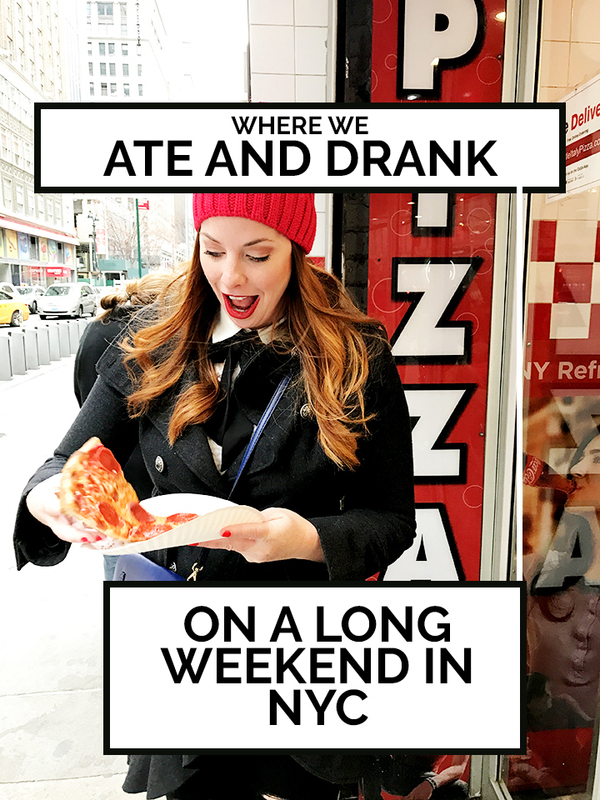 I'm going to split my NYC trip into two blog posts, one for the things we DID and one for the things we ATE and DRANK. Seeing as food is the most important thing to me on vacation (I generally ask about dinner while at breakfast) I thought I'd cover what we ate, first! Before we dive in, just a reminder that today is the very last day to sign up for Helene's Instagram for Success course. 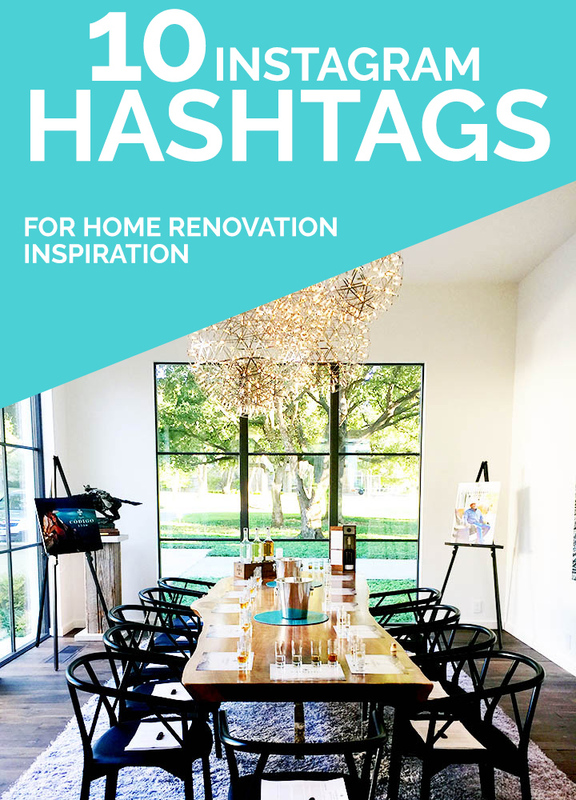 I talk all about it in THIS POST, and how it has helped me build a brand new instagram account from 0-7,400 in just six months! Helene offers payment plans as well, but act today or else you'll miss it for good! 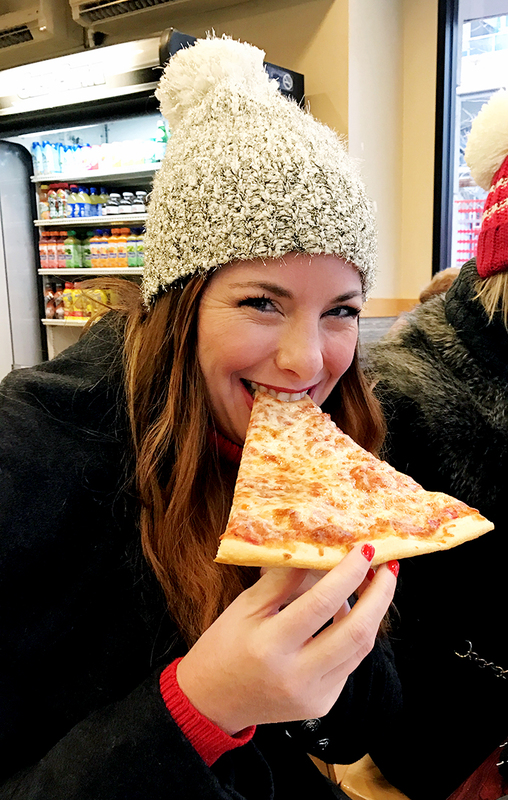 I think everyone thought I was joking when I said I had plans to eat nothing but pizza 🍕 while in NYC. I wasn't. Ok, so I didn't eat pizza and nothing else -- but only because there were times pizza wasn't an option, shocking, I know. 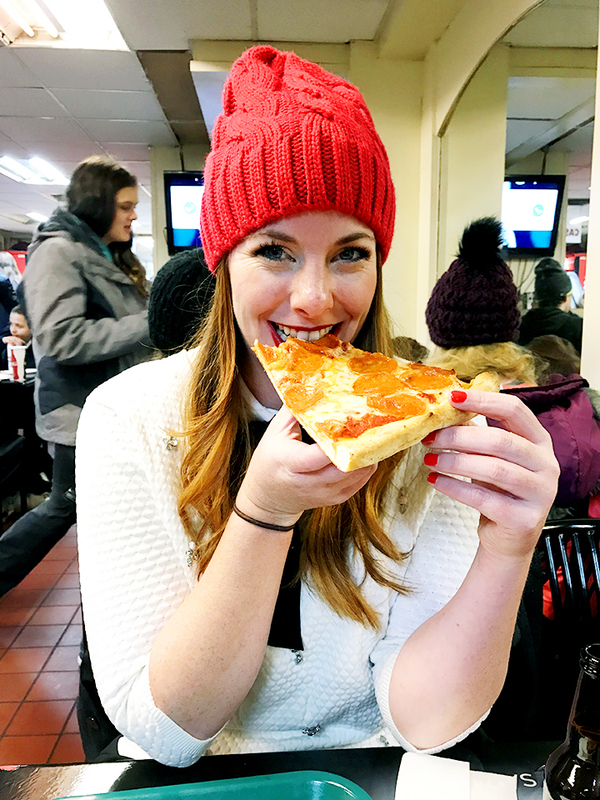 Below are the places we ate and drank around NYC, plus an honest visitor review of each place! I had some really good recs that I wasn't able to hit and I'm kind of heart broken over that. 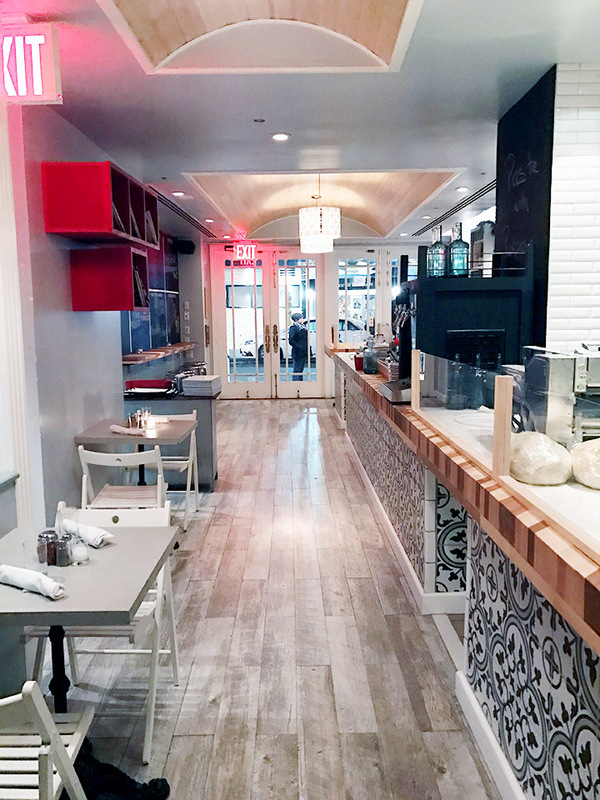 My friend Nicki recommended Joe's in Greenwich and I wasn't able to get over there. 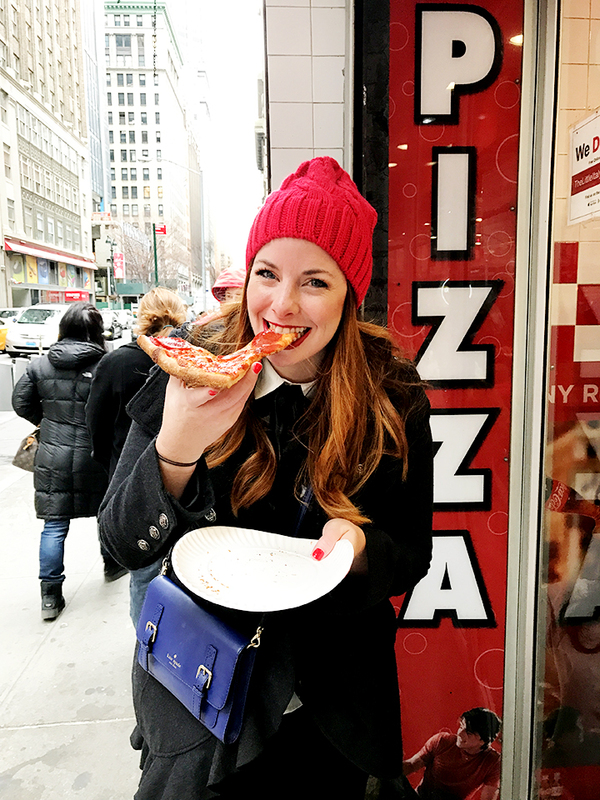 I'm contemplating going back and only going for a pizza tour of NYC. Is that weird? I would really need to work on my Subway navigation because.... holy crap that was difficult. I'm not sure how everyone manages to catch on to how that whole system works. I'm very impressed by you New Yorkers! Also, I'm very prepared to stand by my feelings and taste buds on each slice of pizza. If you hate my tastebuds, take that up with them, not me. 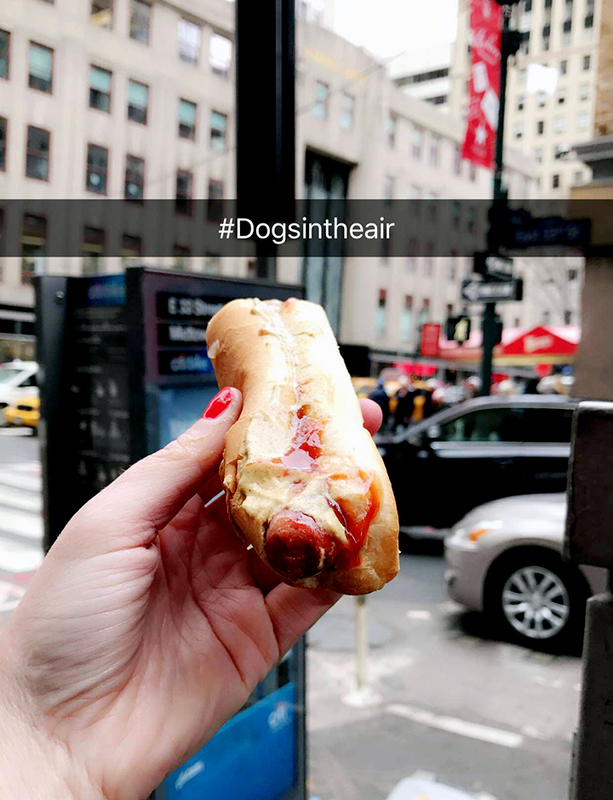 Classic hotdog. Nothing fancy, just ketchup and mustard. Would have given it 3 stars but they added the ketchup and mustard for me which meant less time without a glove on in 30 degree weather. That earned an additional star. Yes, this is the same address as stop 1. Yes, we ate a hot dog and pizza back to back. You mad, bro? I'm a sauce freak when it comes to pizza. The more, the merrier. 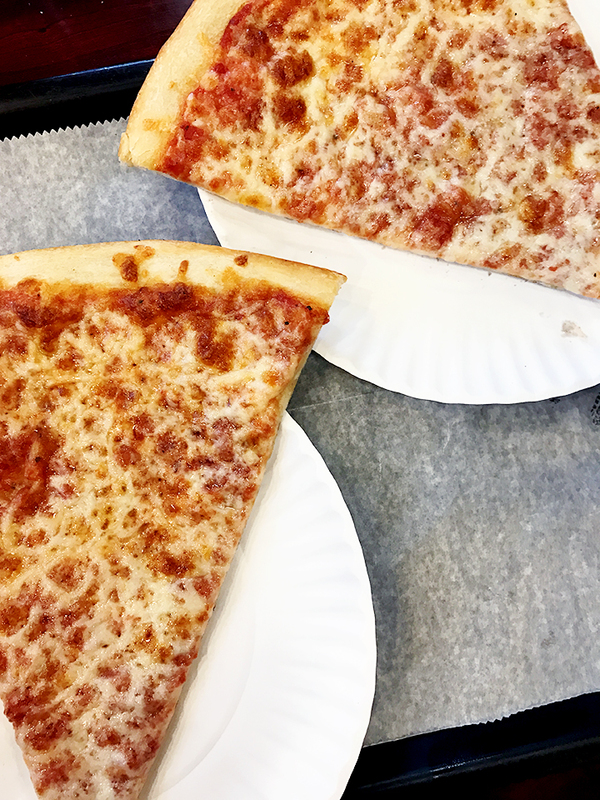 They loaded the sauce on this traditional slice of NYC Pizza and it tasted like heaven. I'm holding my only 5 star rating for my favorite slice, but this was a VERY CLOSE runner up to favorite slice of pizza ever. It was very, very good. One of my favorite spots I've ever been to in NYC. It made me feel so chic and special. If you are on a tight budget, this is not the spot for you. I'm normally a cheapskate, but I let it go for this special stop. 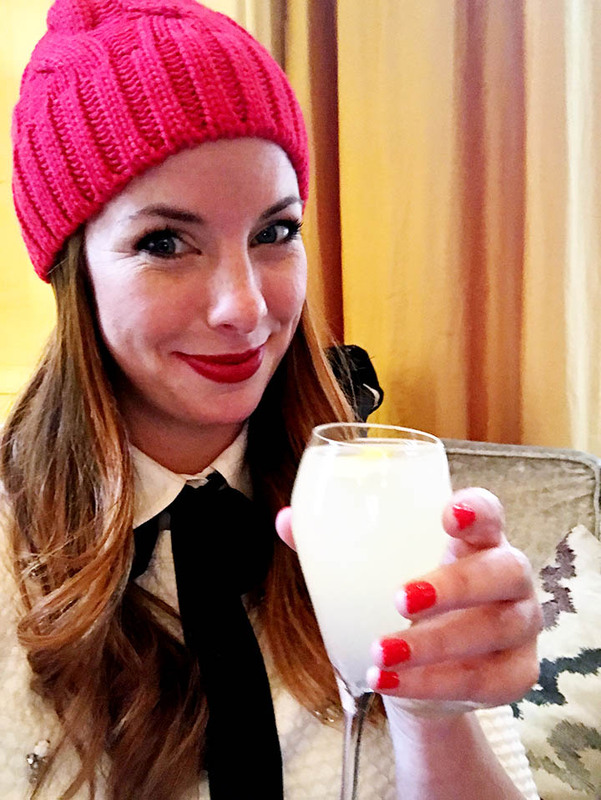 I had a $24 French 75 and savored every sip. 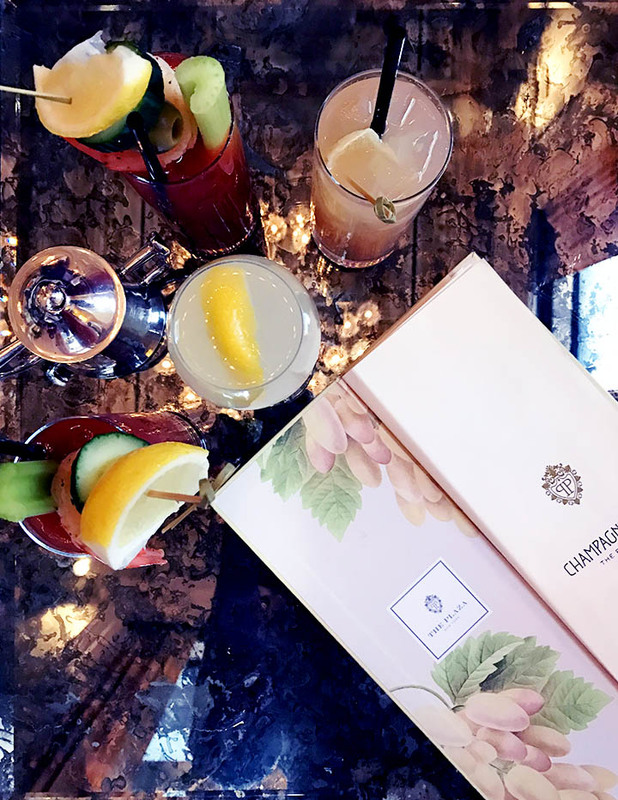 It was beautiful and a must visit for a special cocktail treat! I met Greg when he came to Dallas to visit my friend Larissa back in May. He's a super cool Irishman who makes a mean dirty martini and will charm your socks off. We spent Sunday strolling NYC with him before we headed off to the Cowboys game, but the rest of our trip we spent drinking at Pig and Whistle. Ok, maybe not the entire trip, but a solid 3 nights! LOLS! When you find your home base, you just gotta ride with it right? So, highly recommend! Go tell Greg hi and tell him to come visit us in Dallas again! Highly average. I'd give it a one star but there is no such thing as bad pizza. I was starving and it was next to Pig and Whistle. If you need me to sum this up in one quote, "It did the job. Nothing more." Anyone remember that scene from Knocked Up when the two ladies try to get in but the bouncer calls them out for being too old and too pregnant? It felt like that. The dude let us stand in line only to tell us 45 minutes later that you couldn't get in without a reservation. What I thought was a super cute crop top outfit failed, hard. Bouncer one, Sarah Zero. CB out-ordered me here, but I vowed the entire trip that if Pizza was an option, I needed to order pizza. CB ordered one of their Italian Hero Subs which looked and tasted phenomenal, and I ordered a plain cheese pizza which was pretty good considering that was not their specialty. I would have given 3 stars, but the customer service was excellent. Guy that worked there: "That'll be $64." CB: "For a Pizza and a Sandwich????" Come on now, you think I'm going to give that place 5 stars after a Cowboys loss? We did have a great time though. It was my first cold weather football game and only 3rd NFL stadium, ever! It was CRAZY how many Cowboys fans there were at this game! We travel well! We ate popcorn and hot dogs and drank local IPAs. More about this stadium experience in tomorrow's post. Here we are in the warmest place in the stadium! Greg (from up there at Pig and Whistle) introduced us to his childhood friend from Ireland, Oliver. Oliver is THE BEST EVER and seemed to have as much fun with us as we had with him! Again, a mean dirty martini awaits you at Smith and Wollensky.... ask for Oliver! Didn't take any pictures. Boo, me. One of those, I AM SO HUNGRY I CAN'T WALK A MINUTE MORE WITHOUT EATING, stops. Wouldn't send anyone here, pizza wasn't that bad though! This. Place. Was. Outstanding.... and quite frankly, pretty affordable by NYC standards. 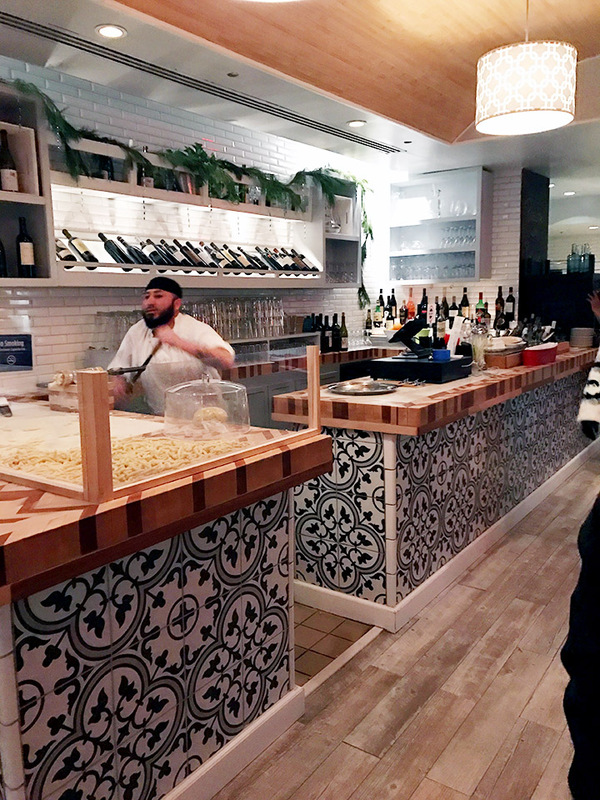 I even wrote my very first yelp review I was so impressed with the food, prices and service. 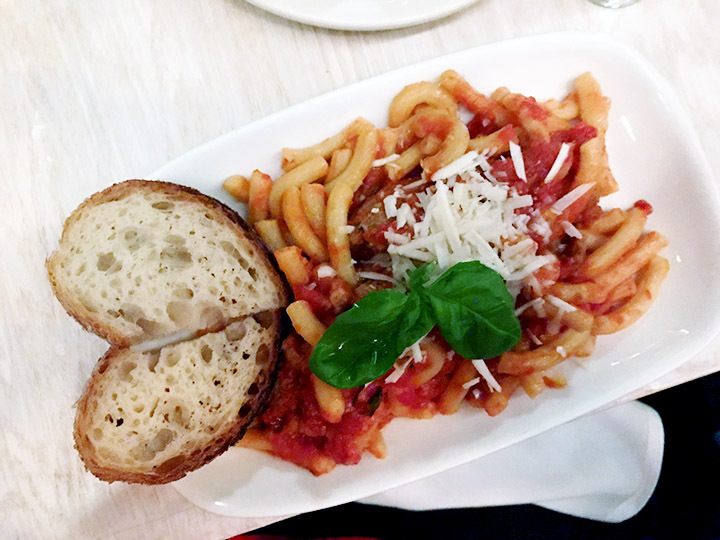 A glass of rose and a big dish of pasta (Rigatoni with Broken Meatball Sauce) for less than $20.... IN NYC!!!!! 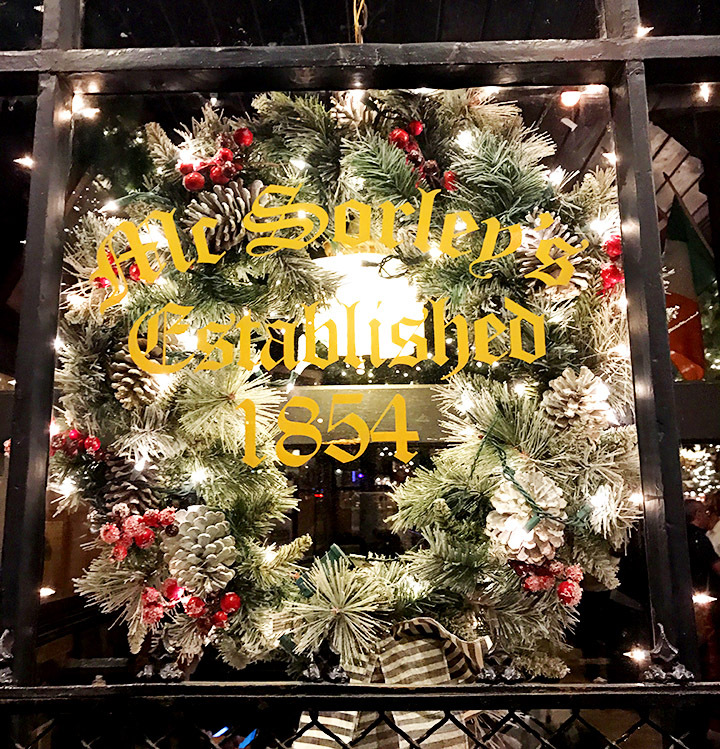 NYC's oldest operating saloon. 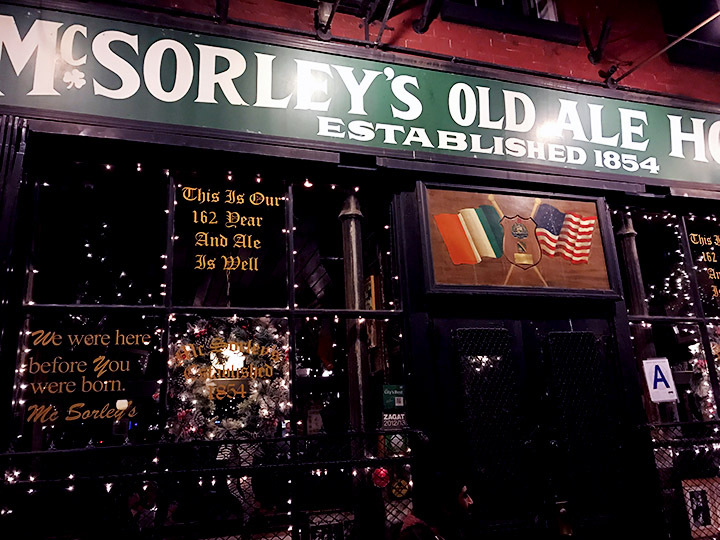 ABE LINCOLN passed through McSorleys. 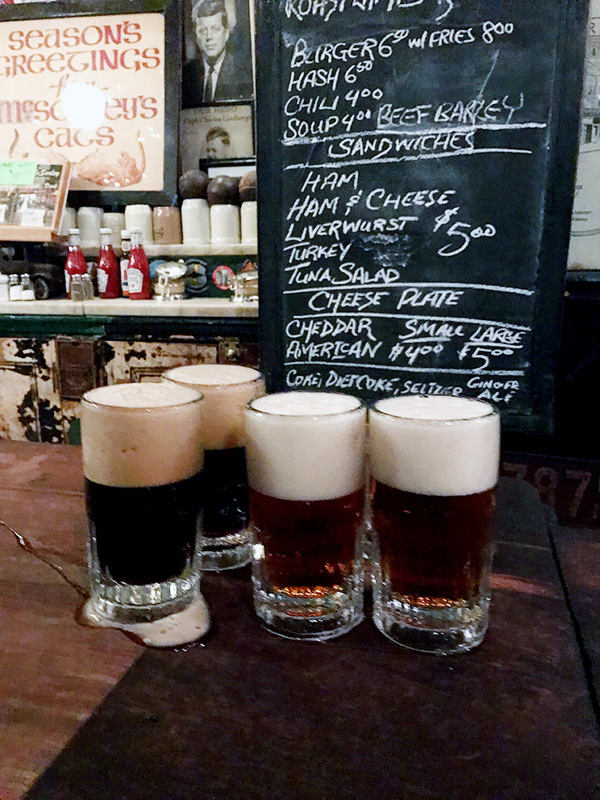 You get two choices: light beer or dark beer, and they come two at a time. This place is CASH ONLY but very affordable. I think it was just $5.50 for the two beers. Service great, beer tasty. Simple, easy, fun. Recommend. One of the most famous Deli's in the country certainly was a disappointment for me. Maybe it was the fact that I was blindsided with a $24 sandwich, but it really did nothing for me. For what it is worth, CB loved every bite of his. 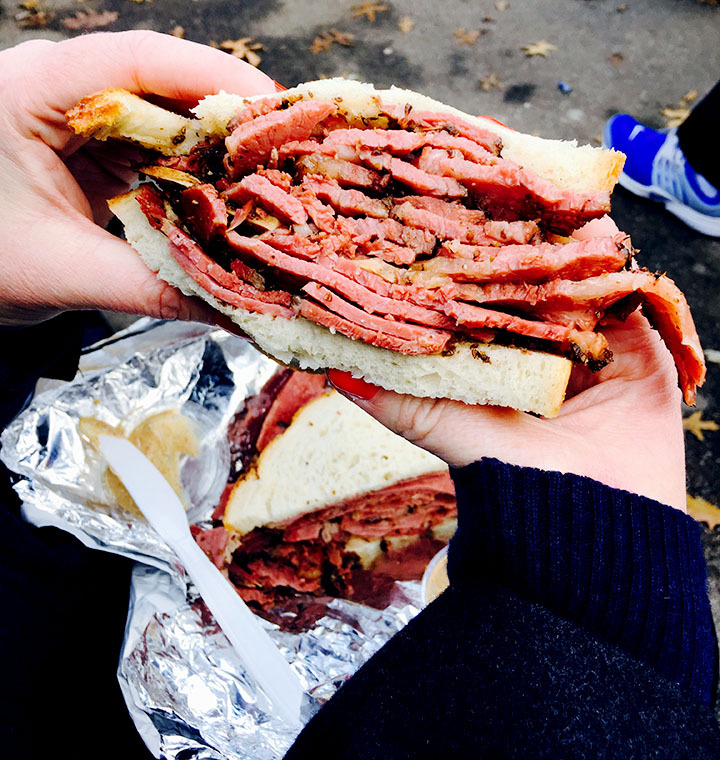 I got the corned beef, CB got the pastrami -- both per the server's recommendation. I think since they are closing their doors on Dec. 31st, they maybe stopped caring? I dunno, I just wasn't a fan. Our last pizza stop of the trip came just 30 minutes before we had to leave for the airport, and I was SO PUMPED to find that we saved the best for last. This pizza was coated in delicious pizza sauce and covered in cheesy pepperoni goodness. 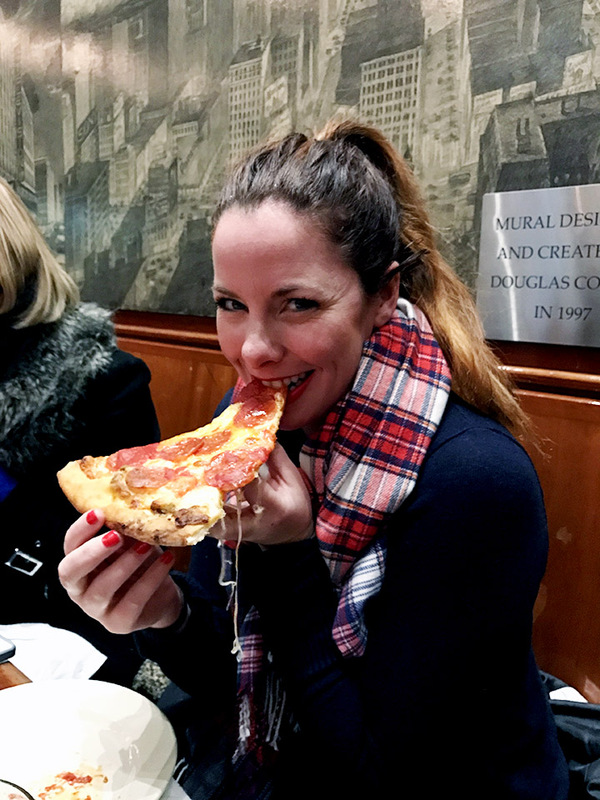 This was the best slice of pizza I had while in NYC -- with Little Italy being a very, very close runner up. 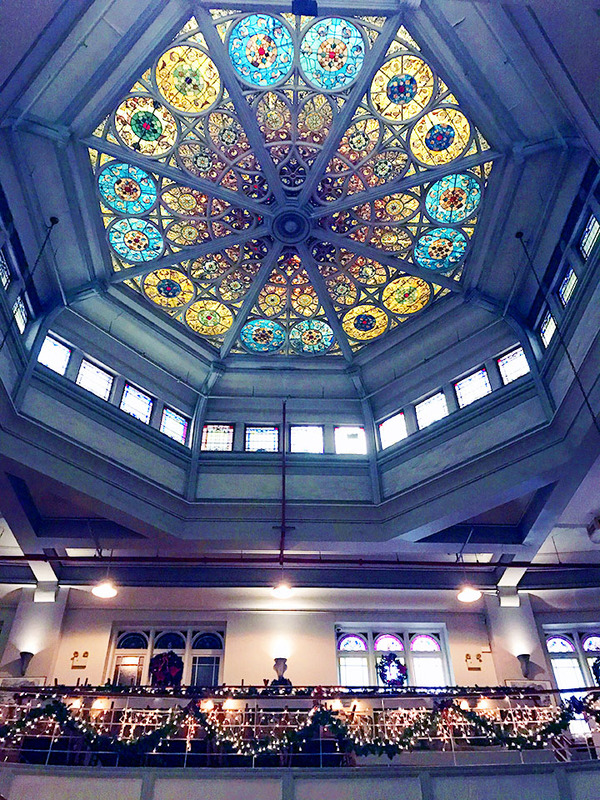 John's is a sit down pizzeria, housed in an old church. THE CHURCH OF PIZZA. No wonder I loved it! 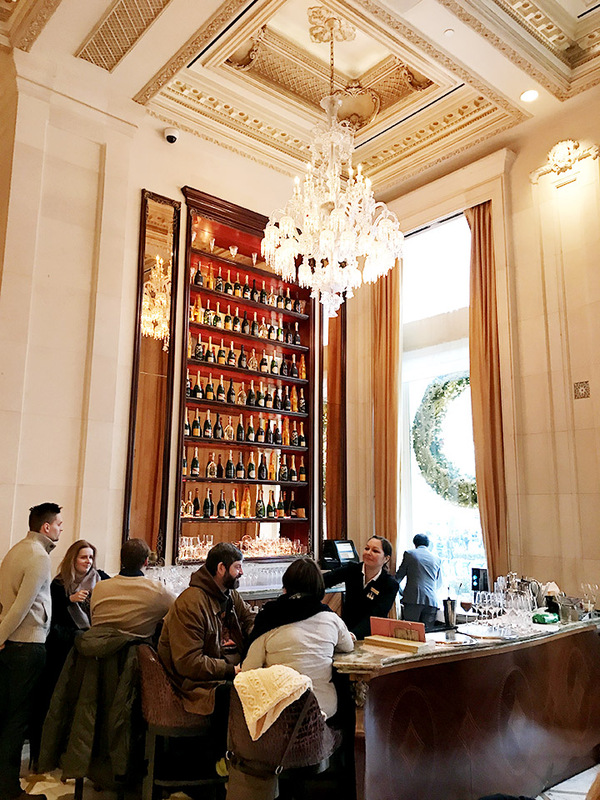 Hope you liked this post and have a couple of places you can visit on your next NYC trip! I'll be back tomorrow with more on what I did for play while in NYC! I'm know many of you guys are NYC die hards, I'm curious to hear what you think of my pizza choices! Or any of my choices for that matter, let 'er rip in the comments section! I've always been in love with doing hair. Growing up playing basketball, I was always the one all the girls would come to for french braids in their hair. I remember when I was little I told my mom I wanted to be a hairdresser growing up, and maybe even own my own salon. Back in the day, before the days of YouTube, I used to love watching infomercials and QVC when they'd do hair demonstrations. 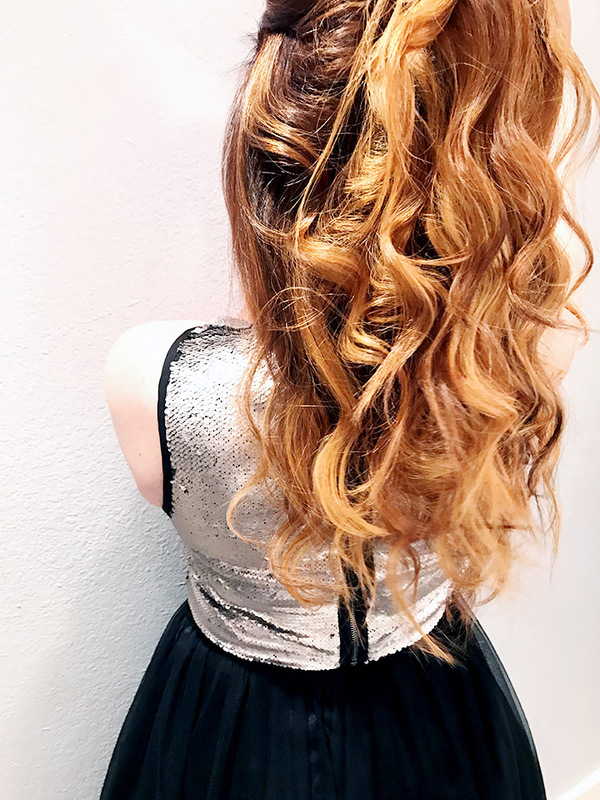 Sometimes they were giving a blowout, sometimes they were using a flat iron – regardless of what they were doing I wanted to watch it over and over again to try and learn a new technique. My hair is so curly and has a mind of it's own. The quality of products I need to use are extra important because my hair dries out so easily, especially in the winter months. Not to mention the stress I put my hair through with blowdrying, flat ironing and using a curling wand. 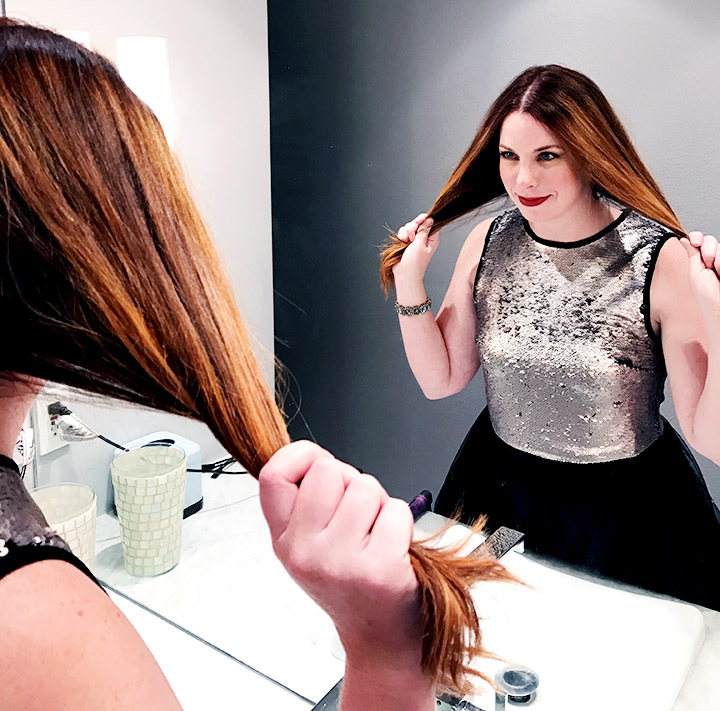 A couple of weeks ago I started using the Pantene Pro-V Smooth & Sleek Collection. 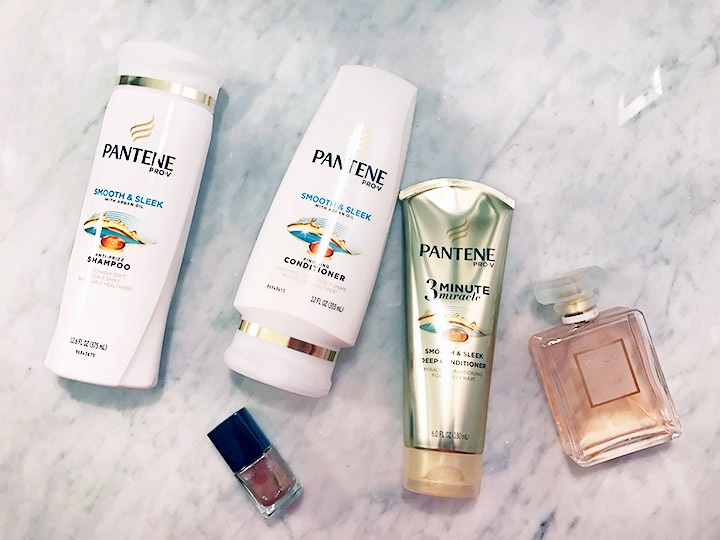 This particular collection of Pantene products features an anti-humidity technology which I'm obsessed with because I'm one of those people who checks the humidity before straightening my hair. This anti-humidity technology locks out frizz and extends the life of your smooth style. 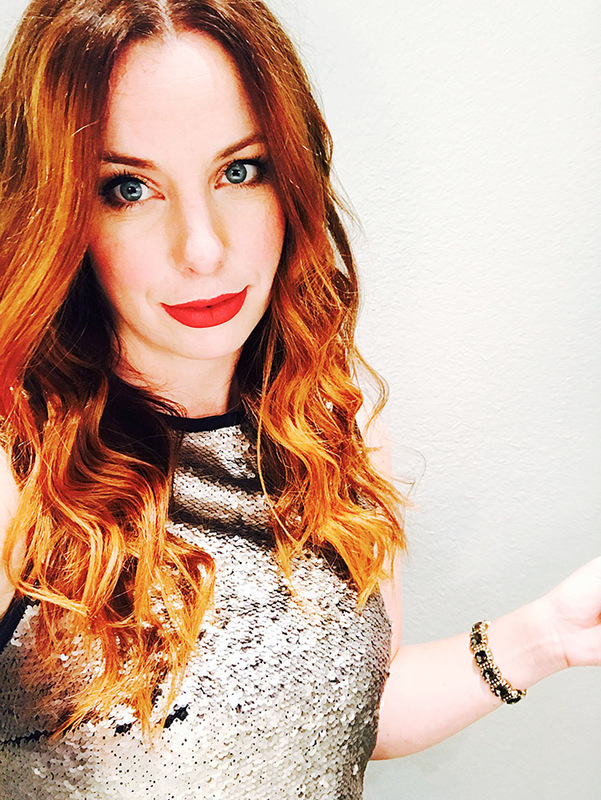 I had an event to attend this past weekend, where I needed to majorly up the glam factor. 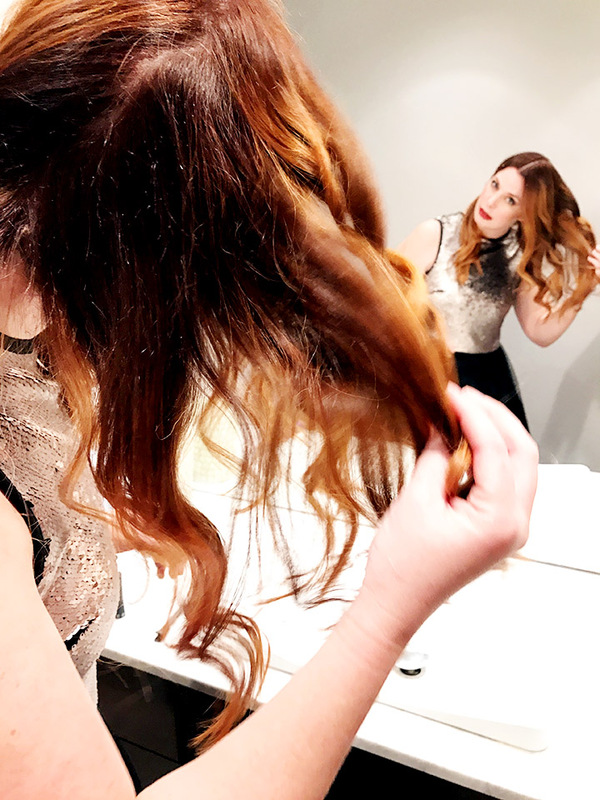 I thought I'd take you step by step how I do my hair for a special event. I started with the Pantene Pro-V Smooth & Sleek Anti-Frizz Shampoo and Finishing Conditioner. I then followed up with the Pantene Smooth and Sleek 3 Minute Miracle Deep Conditioner which is quite possibly my new secret weapon. After just 3 minutes my hair felt completely different, and so much more manageable. I then gently towel dried my hair -- being aggressive while towel drying can cause major damage, I usually just pat it dry -- and used a round brush, blow dryer and flat iron for the rebellious pieces around face. 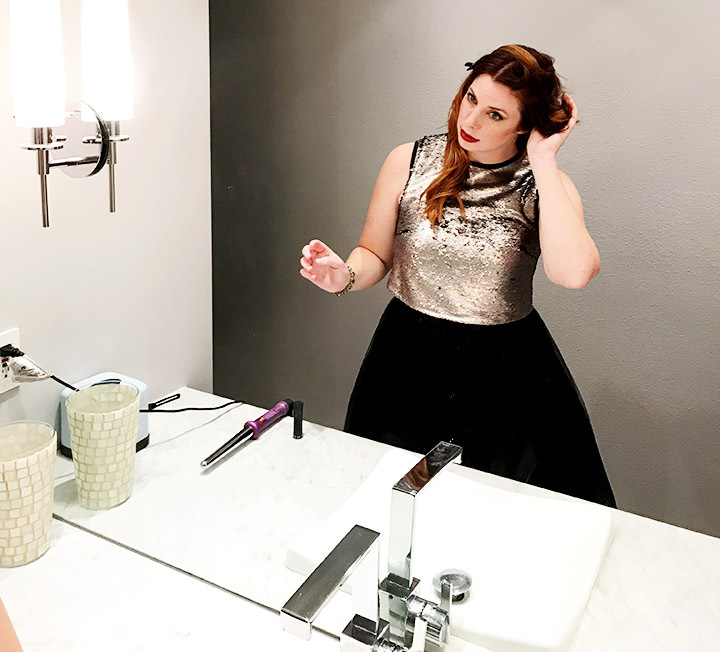 Once everything is smooth and sleek, I then go back in with my curling wand. I start by parting my hair down the middle and work from the bottom up in small sections. I first start with the right side of my hair, tying up the left side with a ponytail holder. I take a small section from the base I hold the wand with my left hand, and twist the hair -- AWAY FROM MY FACE -- with my right hand. I usually hold the wand in my hair for about 10 seconds. 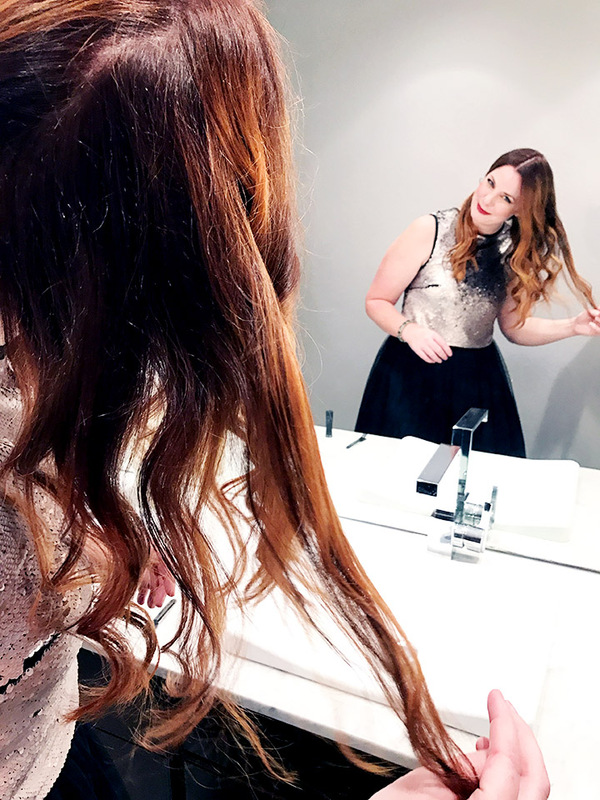 Here is the key trick that will make the curls stick. 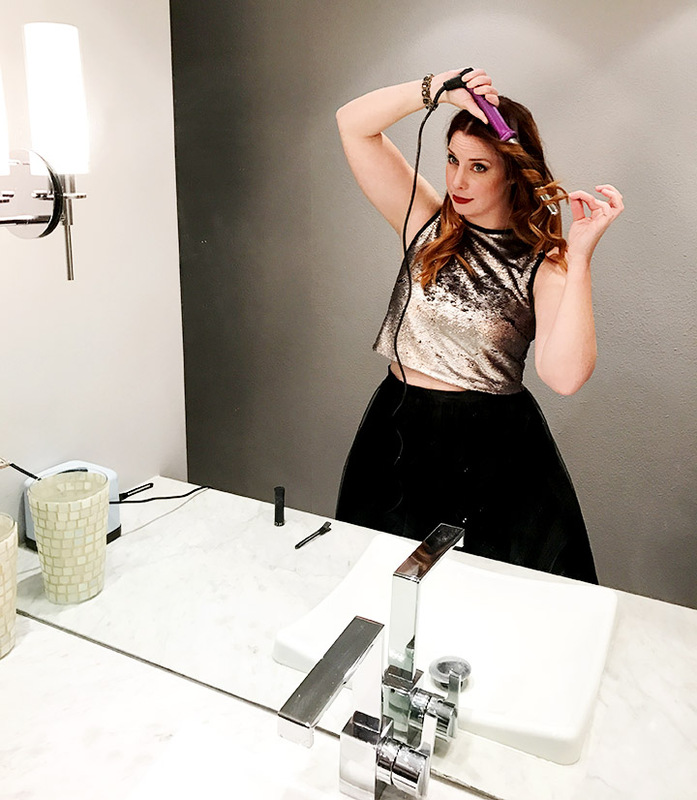 As you remove the wand from your hair, allow the curl to sit in the palm of your hand and cool for an additional ten seconds. Then release the curl and move to your next section of hair! Once you've curled all the way around, shake out your hair for a looser, more beachy curl. For an even "beachier wave", you can run a flat iron through only the ends of your hair. .... and voila! 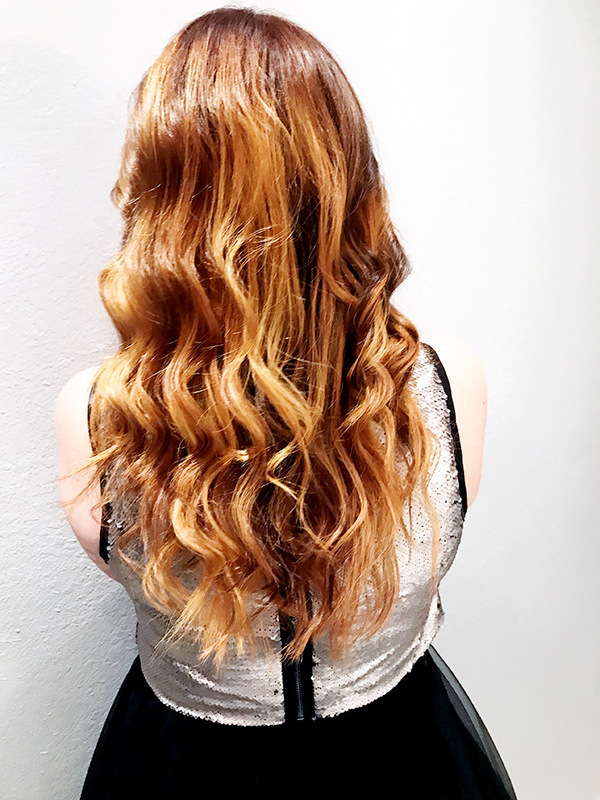 Shiny, voluminous waves that will make you feel like a million bucks when you walk into a party! 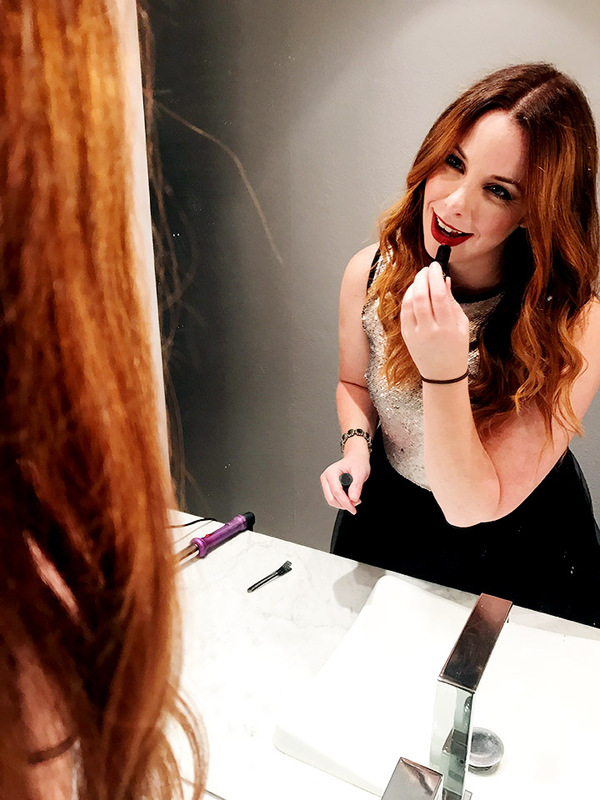 Bonus points for a bold, red, holiday lip! 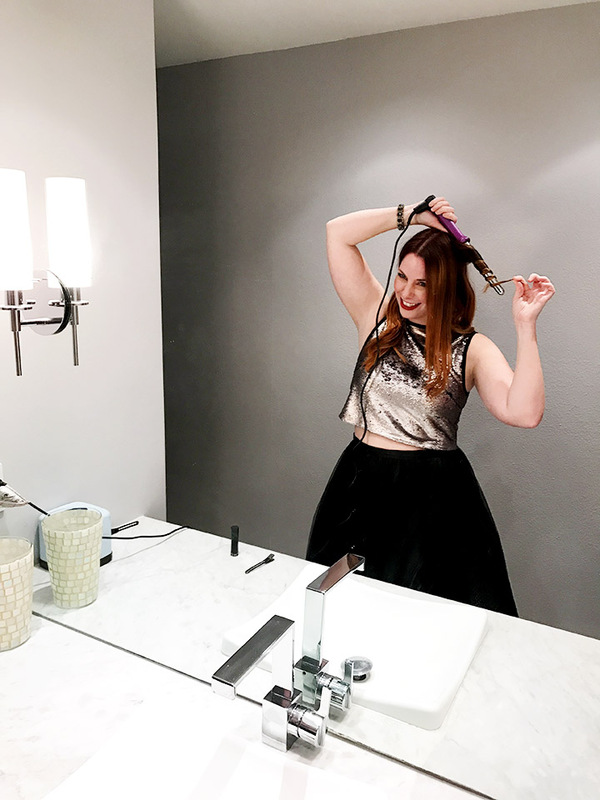 For all my curly haired ladies who love to straighten their hair and have a PANIC attack over a forecast with a high humidity, you've gotta pick up the Pantene Pro-V's Smooth & Sleek Collection for the silky strands you deserve. You can find the Pantene Pro-V Sheer Smooth & Sleek Collection and many more products on Amazon! Having your hair products shipped to your home is a huge time-saver.